Okay, my NaNoWriMo.org book got derailed by my reading of a five book series. It was so good I did not open my computer for three days. Sonja Bateman’s DeathSpeaker Codex series is about this guy who finds out he’s not quite all human. Enter now many different worlds with each book, the story gets richer and you get more addicted to Bateman’s fabulous writing. I swear I watched a movie instead of reading five books! If you have read Laurell K Hamilton’s vampire and Fae series, this book series is for you. If you haven’t, this book series is for you. The whole series is available through Kindle Unlimited, which just makes it that more awesome. 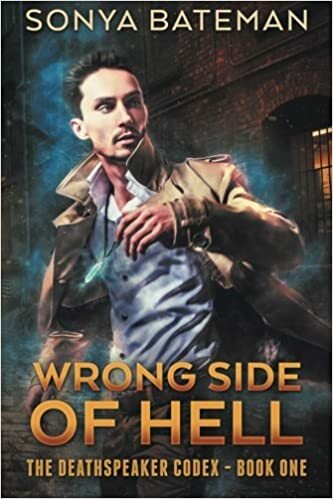 Wrong Side of Hell Book #1 in the DeathSpeaker Codex series This link takes you to the first book of the series on Amazon. Give it a go! First Book! This link takes you to a pictuer of the cover of the first book but if you already clicked the link above, don’t bother, you’ll have seen it! Sadly, back to reality lol! Okay National Novel Writing Month which ends on my birthday here my call, “I am going to finish my story!” Where Angels Weep, here I come!